Let’s be frank. Tastings are pretty tedious, aren’t they? You might make a discovery or two at one, or have a chance to have a chinwag with a grower at another, but, by and large, they are predictable, occasionally frenetic, affairs, from which you emerge barely the wiser and with the feeling that you have hardly digested what was on show. Wines are almost invariably presented in a clunky generic way, grouped by country and region, grower or estate, occasionally by grape variety. Think of the ways we actually experience and appreciate wine though. How about by style, terroir, soil type, or winemaking method? Where does feeling come into the equation? This is a far more interesting framework within which to encounter and explore wine; the categorisations are fluid, provocative, even controversial. Let’s start with some of the preconditions that help to make the wine smell and taste the way it does. One, for example, is soil-type and how the fact that vines grown on certain soils produce grapes that seem to reflect their origin in a specific character. Some might say that one can’t taste the particularities of soil or minerals in the final wine itself, but the organoleptic properties shared by the wines themselves would suggest otherwise. Limestone, granite, schist or basalt appear to leave their respective residual impressions on the wines in question and wines from vines grown on these soil types share more in common than wines that merely happen to come from the same region. Soil is only one factor, however, amongst many. Meso/macro climate – the influence of the sea or the mountains, rivers and lakes and the more local geo-climatic subtleties, are paramount in creating the conditions wherein wines have a predisposition to exhibit certain characteristics. The specifics are more complicated, and certain categories require a measure of qualification. For instance, one might group wines by the altitude of the vineyards in which they are grown. A wine from a vineyard at 1000m in Mendoza, however, is very different to one at the same altitude in Alto-Adige. Climate is much more than a simple numbers game. Some generic tastings highlight a particular grape variety, or varieties…If we value farming and terroir expression, then grape is surely the vehicle for transmitting true and complex flavours determined by soil, environment and vintage, rather than the primary source of flavour itself. The quality and method of farming is crucial to, and underpins, all our potential categories. The more chemically-intensive the farming, the less likely we are to taste the differences necessary to create “terroir-category” groups. Some generic tastings highlight a particular grape variety, or varieties. On occasion it can be useful to compare the interpretations of variety from one estate/winery to another, or from one region to another. Often though what we may think of as a varietal signature is the product of particular yeasts, or a highly controlled method of fermentation, or even the tendency for that grape to be raised in new oak. If we value farming and terroir expression, then grape is surely the vehicle for transmitting true and complex flavours determined by soil, environment and vintage, rather than the primary source of flavour itself. And so, we come to winemaking: the use and type of fermentation and maturation vessels, skin contact, ambient versus controlled ferments, the work on the lees, malolactic, oxidation/veil ageing etc. Since dozens of choices and consequent interventions (biological and/or chemical) combine to make the wine what it is, it seems desirable to have categories highlighting skin contact/orange wines; oxidative/flor wines and so forth. Outcomes should be reflected in the categorisations – is there a point presenting two Carignans, say, both from the Roussillon, in the same geographical category in a wine tasting, when one is made by means of cold carbonic maceration and is fermented and aged in tank, whereas the other is from destemmed grapes, given pigeage, and fermented and given a lengthy elevage in oak barrels? Given that the wines will taste so very different, is it not expedient to reflect this in where the wines are positioned in the tasting? Because wine engenders so many sensations (and different sensations in different people) there is a lot of potential to evolve interesting and original categories. Fourthly, we should consider the individual aesthetic response to wine. Because wine engenders so many sensations (and different sensations in different people) there is a lot of potential to evolve interesting and original categories. Whereas wine may be viewed in broad (and bland) quantitative terms – light, medium or full, or aromatic, for instance, describing less tangible qualities such as “tension”, “transparency”, “minerality” and “structure” gives an individual taster a clearer feeling about the wines in advance of assaying them. We will show Kelley Fox’s Freedom Hill Pinot Blanc from Oregon, for example, alongside Dominique Belluard’s Savoyard Gringet, because they feel texturally similar and manifest a particular kind of acidity that becomes the spine for the wine. What gives such a tasting its edge are the juxtapositions, making strangers into natural relations by proximity. In other words, we are asking people to conceive of wines more imaginatively. This involves respecting the human factor. Wine come from places, of course; it is also the product of vigneron choice. Winemakers go to tastings, meet other growers, travel the world and return home with ideas and inspiration. At our “Restyling Wine” trade tasting in honour of our 30th anniversary on the 18th September, will show Kelley Fox’s Freedom Hill Pinot Blanc from Oregon, for example, alongside Dominique Belluard’s Savoyard Gringet, because they feel texturally similar and manifest a particular kind of acidity that becomes the spine for the wine. 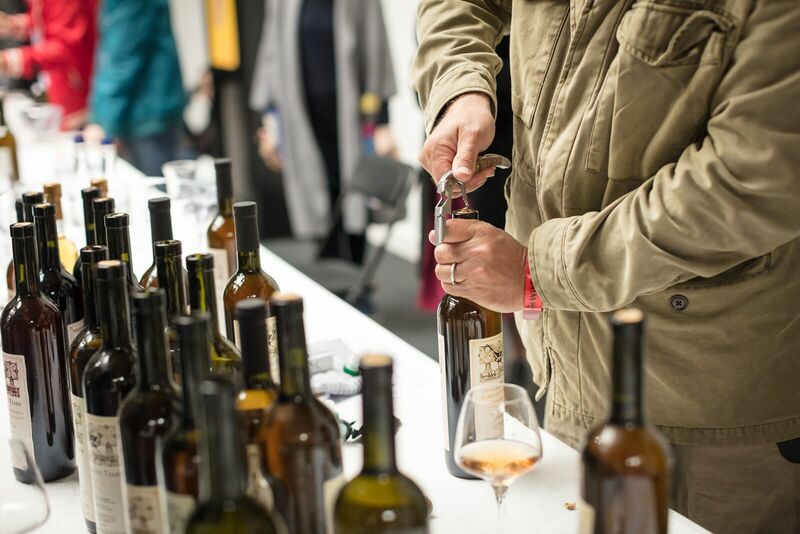 Different growers, different regions, different climates, soils and grape varieties, different fermentation and maturation vessels – yet two wines possessing enough in common to be presented in the same tasting category. One advantage to a tasting organised by style is that the necessarily-challenging format inevitably makes the taster more alert. One hopes that our hypothetical taster does not leave in a puddle of bewilderment, but is intrigued and sufficiently motivated to think about different ways of presenting wines on their lists. One advantage to a tasting organised by style is that the necessarily-challenging format inevitably makes the taster more alert. One hopes that our hypothetical taster does not leave in a puddle of bewilderment, but is intrigued and sufficiently motivated to think about different ways of presenting wines on their lists. 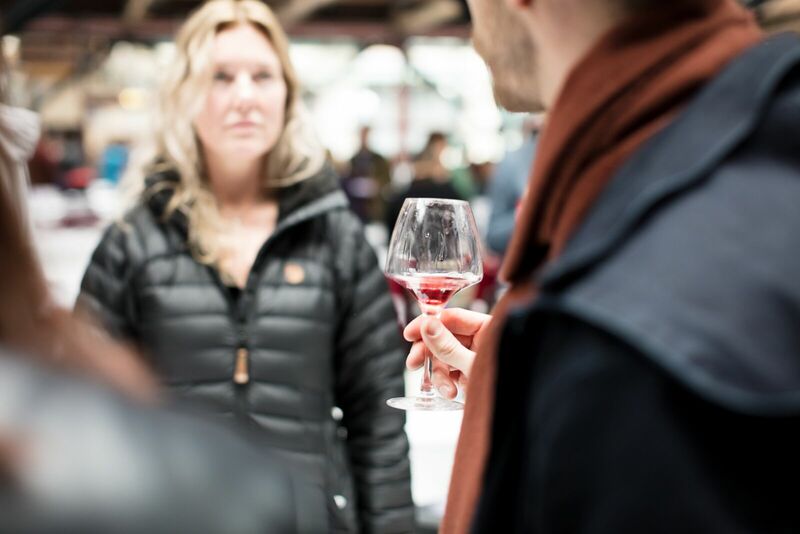 Tastings always have a utilitarian purpose, but are generally so broad and unfocused, that they are increasingly redundant as a means of getting close to authentic wine. 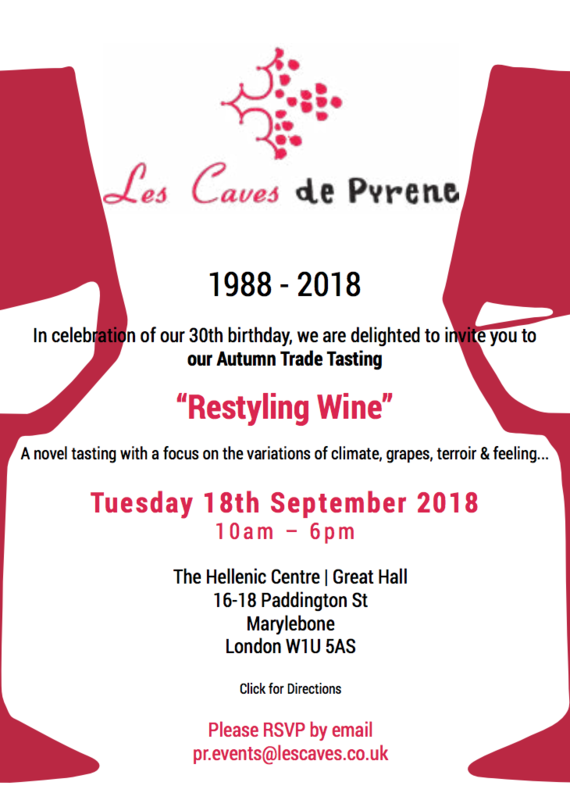 Our September tasting is a not-so-random shuffle of some of our greatest hits into discrete albums, restyling wine, as it were, into categories that get closer to what the wines really are about. More info and registration details for our 18th September trade tasting can be found HERE.